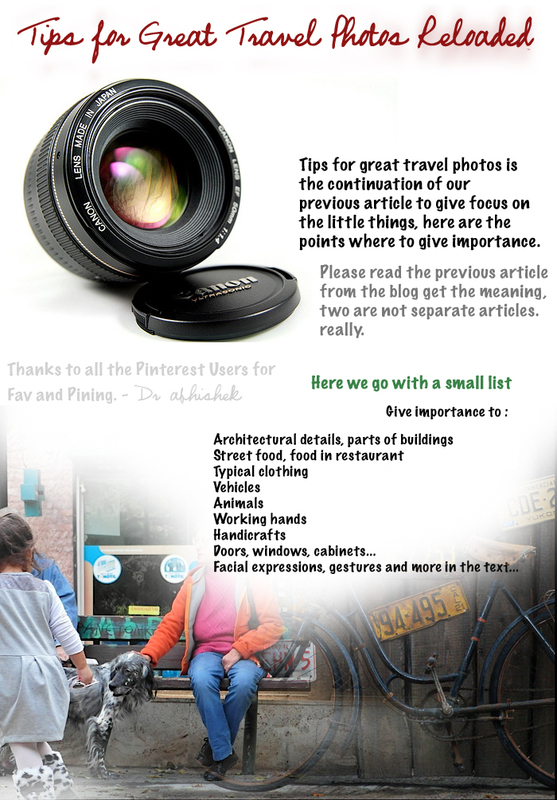 Tips for great travel photos is the continuation of our previous article to give focus on the little things, here are the points where to give importance. In the last paragraph of that article, we said that in the next article, we will discuss about what are the elements which are taken as guide to discover. The photographer should always be attentive to the details and adept to catch them. Your eyes must always be trained to find what the other escapes and focus your mind to turn it into a beautiful picture. Accustomed to do it on the go. A person, who never could create only one photo with good composition with a mobile phone camera or a point or shoot, it is unlikely that there will be a huge improvement after purchasing the DSLR within a month. In fact, DSLR will complicate the learning process. If you are new, fully new to learn photography, we will rather suggest you to use the current one you have, give importance to the theories of the Photography first. These theories are evergreen and constant. DSLR is the technical instrument, when you really feel the hindrance, the limitations of your existing camera; then think of a DSLR. It is possibly difficult to change the habit of looking on the LCD screen versus looking through the viewfinder. If the camera is foreign to me, the foreign country will remain foreign to my camera. Tips for Great Travel Photos : What to Look For ? When you travel, these little things take on a greater value because they describe with greater authenticity of the place you have visited. These individuals can sometimes be mundane, a way to make them more photogenic without fail is to exploit the light. Evaluate whether the light that hits your subject is beautiful, think if it turns out well in the photo to make it special. Clearly, if the only lens that is asked on the road to carry is a wide-angle lens, you will find it hard to focus yourself on the details, especially with the little ones. You will need higher focal lengths. For this reason, the advice is always to have with you a handy focal length of least 70mm (as I suggested in some article earlier). Otherwise, if you exclude using wide-angle lens or a normal lens, you will miss the opportunities. You can find them for all camera brands. We also found shorter focal lengths, such as 35mm, useful for travel photos but we have used only with static subjects and inanimate objects, such as food. To photograph small details of mobile objects with a lens so short you have to go really close and its disturbing. We will suggest, the next time you visit any place, even if only for a half-day trip, to force yourself to photograph as much as possible (or only) little things. In fact, if you want to avoid loopholes, bring only a telephoto lens if you have no other lens, so that the landscapes and monuments will be technically forbidden to you ! This Article Has Been Shared 9855 Times! Cite this article as: Abhishek Ghosh, "Tips for Great Travel Photos Reloaded," in The Customize Windows, August 5, 2013, April 21, 2019, https://thecustomizewindows.com/2013/08/tips-for-great-travel-photos-reloaded/.